These cookies may look like tiny snowballs, but in reality, they are a delightful mix of ground walnuts, butter, flour and powdered sugar. They’re simple to make and look pretty piled on a tray as part of a holiday assortment. They’re also great to pack in small tins as gifts. 3. Cream the softened butter, along with the powdered sugar, vanilla, water, and salt. 4. Using a wooden spoon, mix in the flour and ground nuts. I usually end up mixing this with my hands. Messy, but effective! 5. Cover the bowl with plastic wrap and refrigerate for a couple of hours. 6. Form the dough into walnut size (or even smaller) balls. 7. These don’t expand in size, so you can easily fit the whole recipe on one half sheet pan. 8. Bake for 45 to 50 minutes. 9. Cool completely before totally covering them with powdered sugar. The sugar will stick and create snowballs! 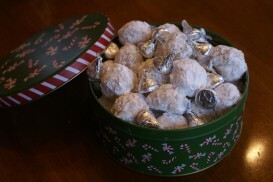 This entry was posted in recipe and tagged confectioners' sugar, ground walnuts. Bookmark the permalink.